Thornton Township’s Board of Trustees will hold a Special Board Meeting on Thursday, April 25, 2013 at 7:00 p.m. to present the 2013/2014 Tentative General Assistance Fund, General Fund and Road and Bridge Fund Budgets. The meeting will be held at Thornton Township in the Boardroom located at 333 East 162nd Street in South Holland, Illinois. •Listen to the radio or television for information. 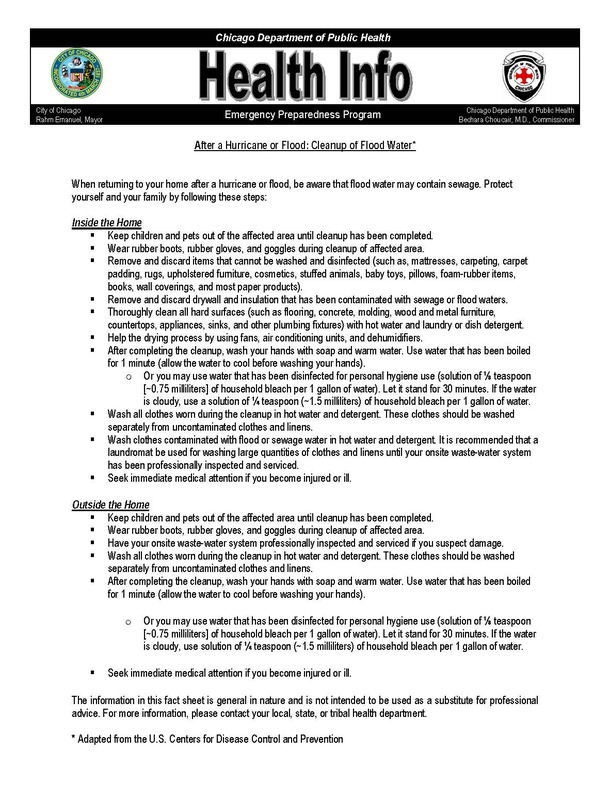 •Be aware that flash flooding can occur. If there is any possibility of a flash flood, move immediately to higher ground. Do not wait for instructions to move. •Be aware of stream, drainage channels, canyons and other areas known to flood suddenly. Flash floods can occur in these areas with or without typical warnings such as rain clouds or heavy rain. April 18, 2013 (South Holland, IL). Early this morning Thornton Township Supervisor Frank M. Zuccarelli communicated with his Emergency Preparedness Team to mobilize, aid and assist residents and municipalities with the flooding efforts that have engulfed the South Suburbs. We have received numerous phone calls from municipalities and residents such as Calumet City, Dolton and Harvey to aid and assist with the flood relief efforts that have engulfed south suburban municipalities. Last summer State Senator Donne Trotter awarded Thornton Township with a grant and partial usage of the grant was earmarked for emergency preparedness efforts such as the air conditioning program last summer where we distributed and installed over 400 air conditioners for the heat wave of Summer 2012. Township Supervisor Frank M. Zuccarelli will have his Emergency Preparedness Team overseeing the flood alert for the duration of the week. “Thornton Township Government graduated over 100 individuals to have a hands on approach to handle Emergency Preparedness such as the existing floods that we have today, heat waves, tornadoes, earthquakes, bombings etc. Thornton Township and South Suburban College are sponsoring the 2013 Community Job Fair being held at South Suburban College on Tuesday, May 21st, 2013 from 10 am to 2 pm. Click on the link below for the printable informational flyer about this event. 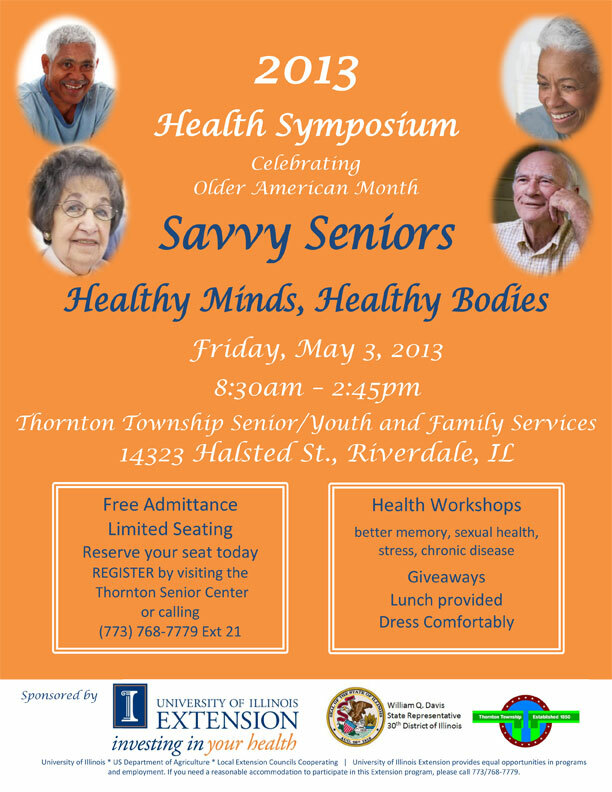 Health symposium being held on Friday, May 3rd, 2013 from 8:30 am to 2:45 pm. Thornton Township Senior/Youth and Family Services located at 14323 Halsted st. Riverdale IL, 60827. Click the links below for informational flyer and printable registration form.